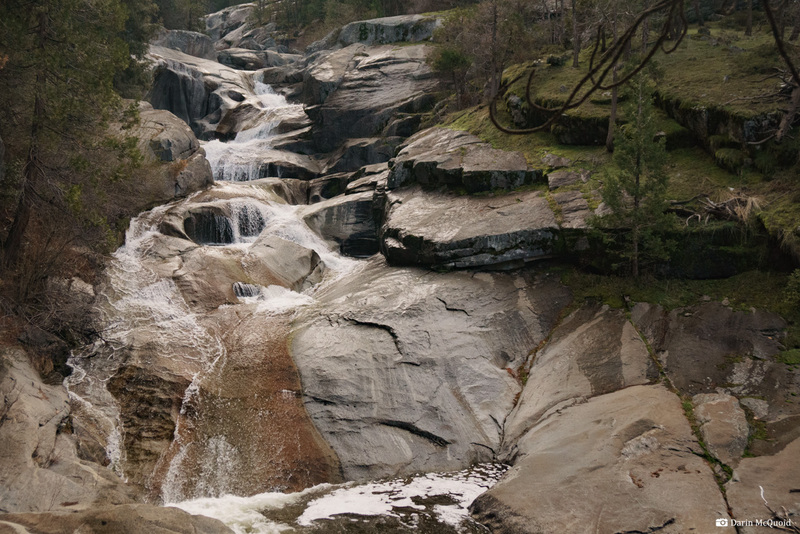 A band of marble cuts parallel to the flow of water through the granite landscape of Sequoia & Kings Canyon National Park. This band of marble creates over 200 caves, most created by erosion of the Kings River, Kaweah River and their tributaries. The marble band also gives some of these rivers personality disorder as they transition from smooth granite through sections of sieve filled marble, then back to granite. 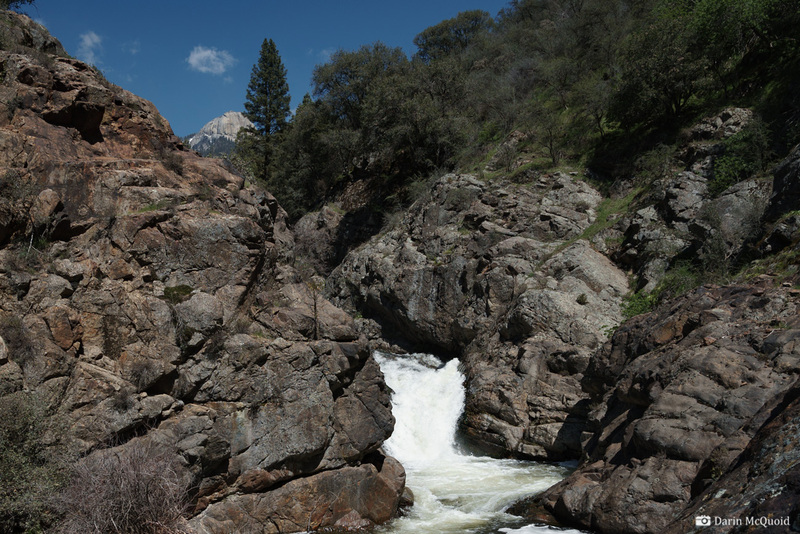 The South Fork Kaweah watershed forms the southern border of the National Park. 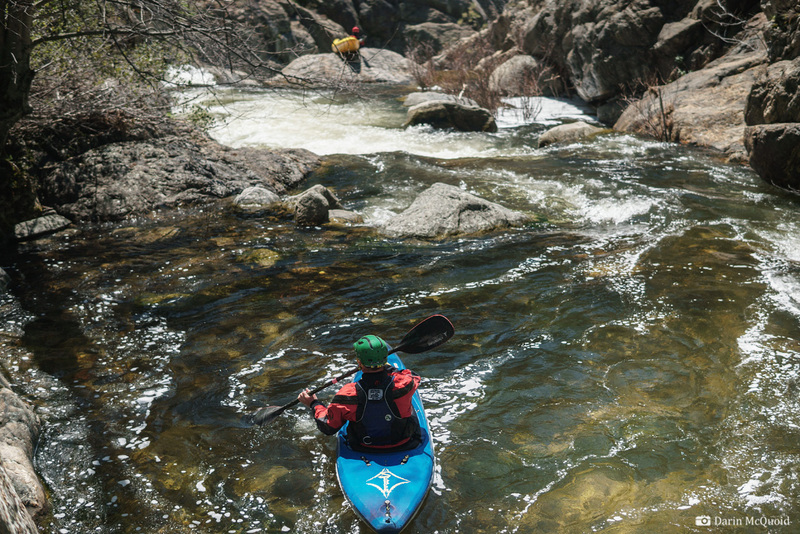 During the mining rush of 1873 to 1875 the trail system was one of several used to supply mining operations in Silver City on the East Fork Kaweah. Later more trails were developed for cattle grazing and access to some of the caves. Eventually a road was built to Silver City, and in 1978 the area was annexed into Sequoia National Park. Now the South Fork entrance is an obscure section of the park, and the trail system has been scaled back. 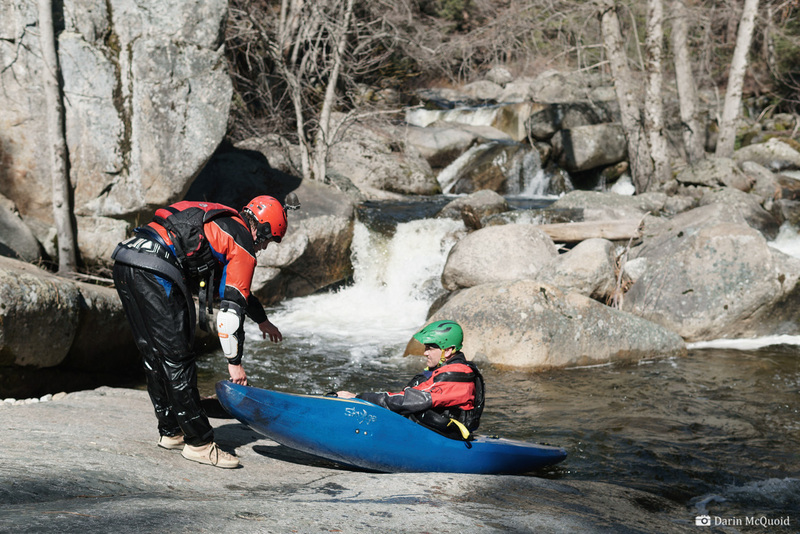 My interest in the South Kaweah was sparked by hiking trips. At the roads end is the South Fork Campground and trailhead. Here the river cuts through the marble band and looks terrible from a paddling standpoint. 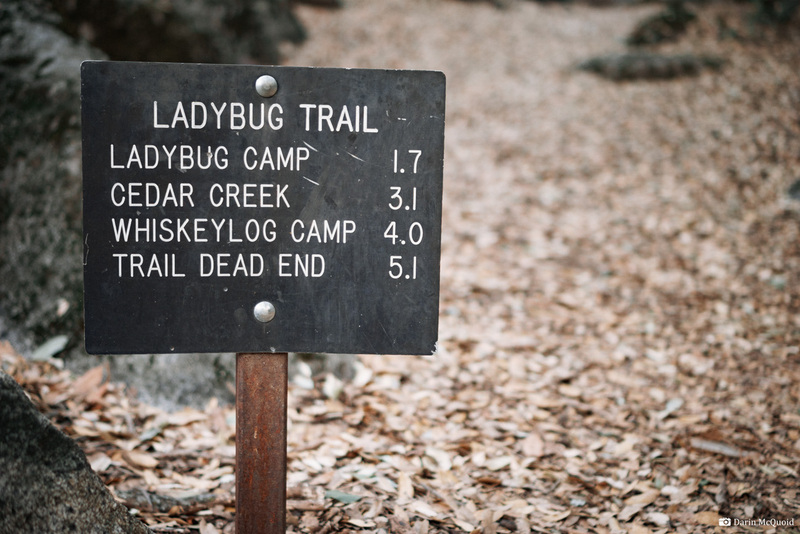 The well-maintained Ladybug trail follows the north side of the river, eventually climbing up a tributary; Cedar Creek, where maintenance ends at a diminutive grove of Giant Sequoia. 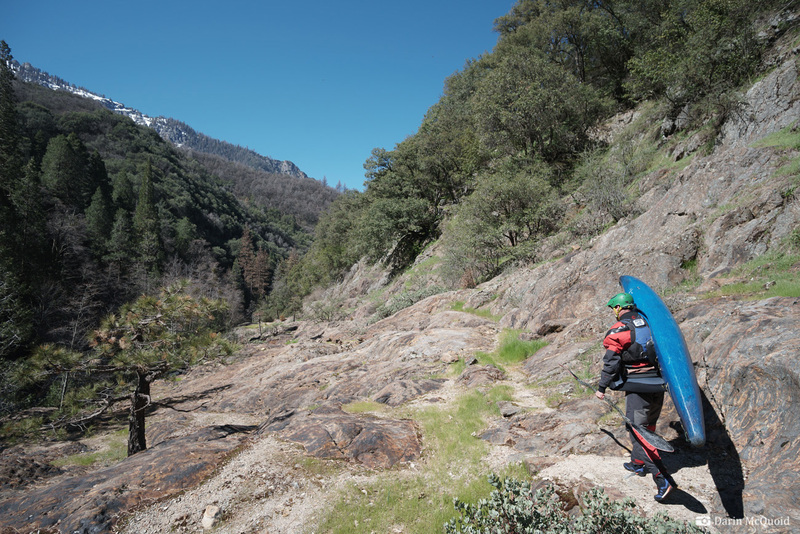 While not officially groomed, the historic trail continues beyond Cedar Creek, and in the spring of 2015, our lowest precipitation year on record, conditions made backpacking the activity of choice. 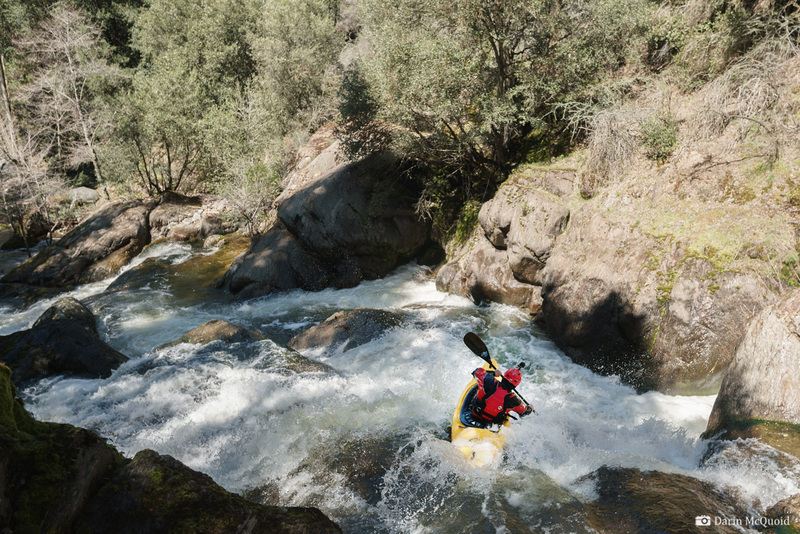 As a paddler, backpacking trips are just an excuse to camp by other rivers. Ok, really, they are just scouting trips under another name. 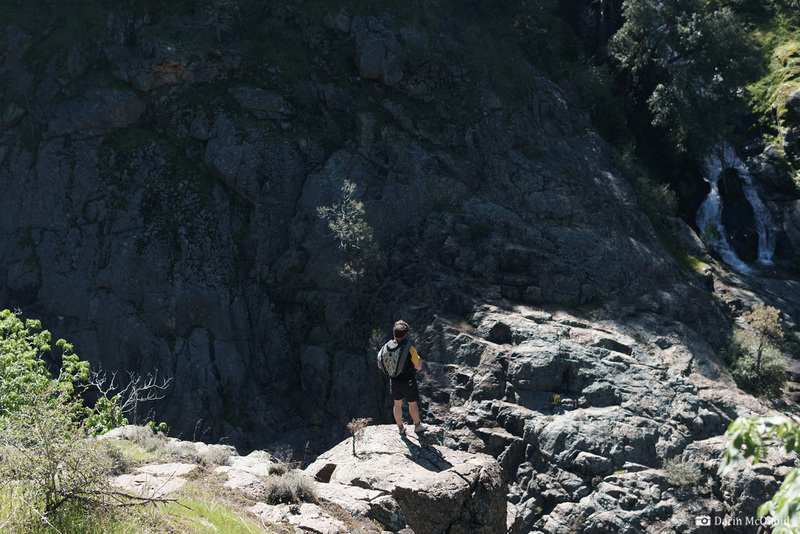 A mile beyond Cedar Creek the trail returns to the South Kaweah, with the river flowing through a steep gorge, and the favorable sight of granite bedrock. 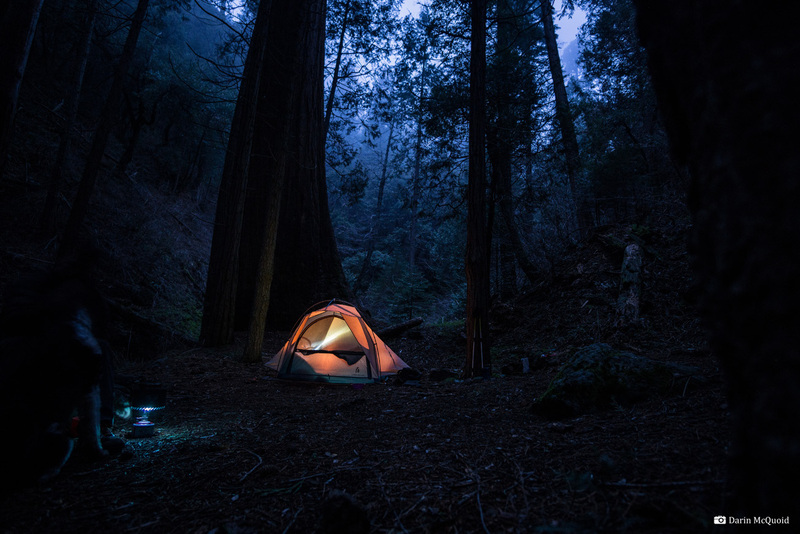 Further up is Whiskey Log Camp, an intimate campsite and the end of any trail preservation. 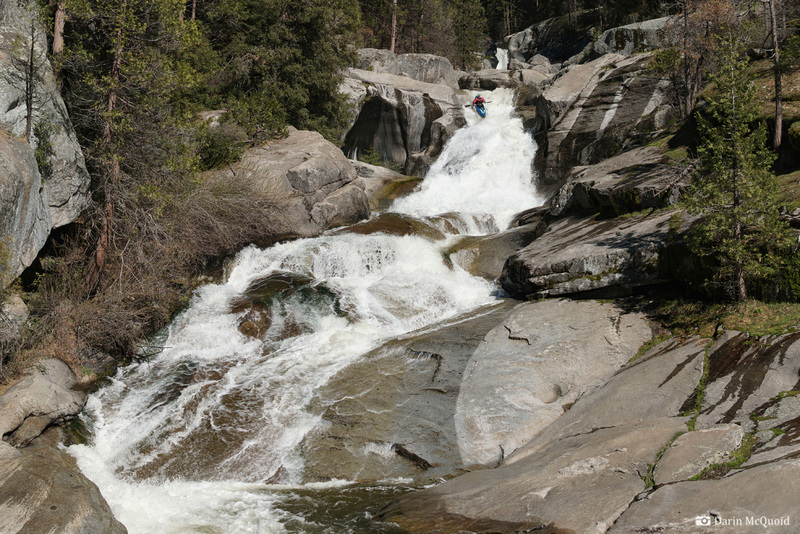 Just upstream is a slide reminiscent of the famous “Skyscraper” slide on South Silver. At first glance I know one day I’ll return to this spot with a boat. 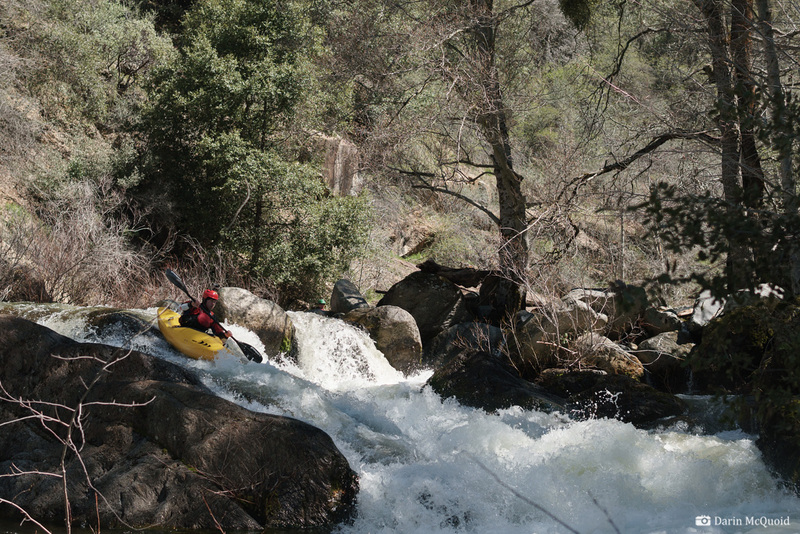 The weather from 2015 to 2017 has been as bipolar as the geology of the South Fork Kaweah. 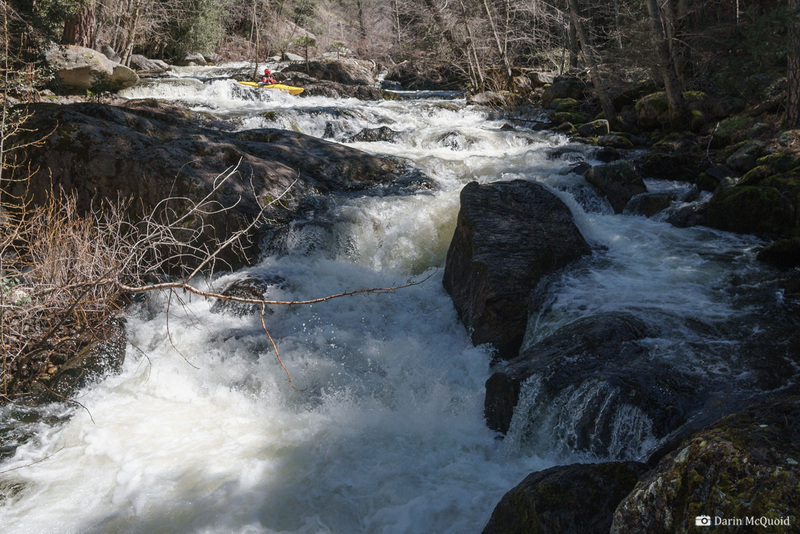 Two massive floods early in the year ripped brush out of the rivers and near record high snowpack dictate a year to do obscure waterways because classics are too high. 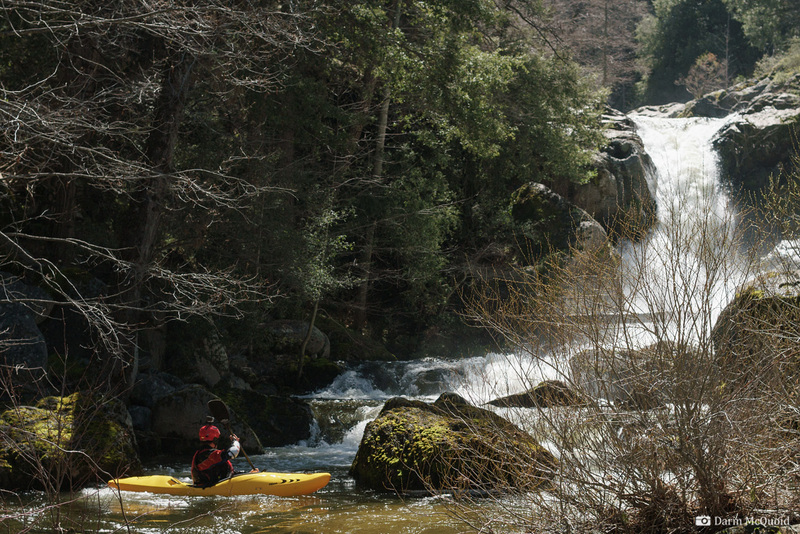 A five-mile hike, just to portage downstream? 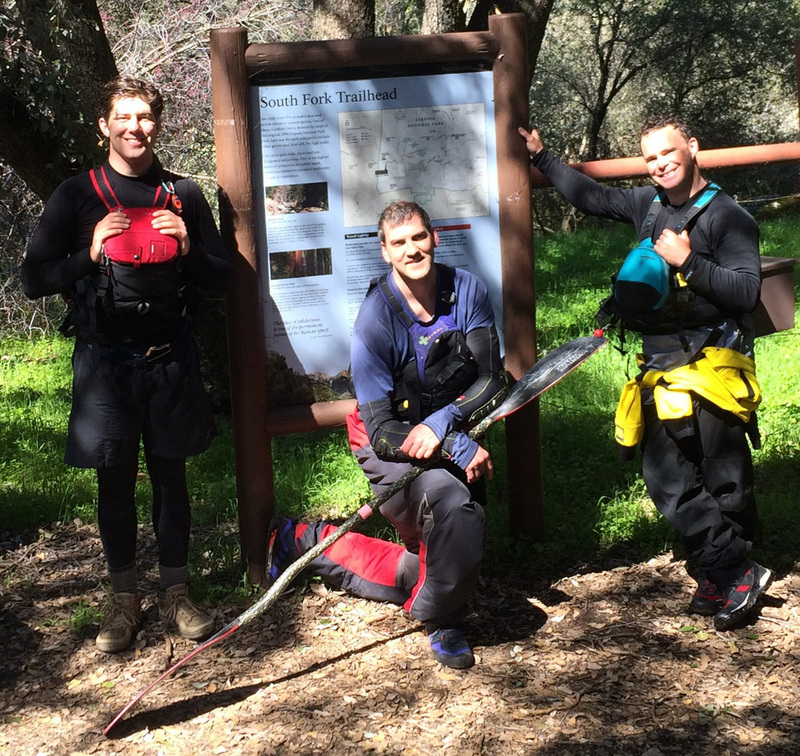 That’s how Is ell it to Robbie Gilson and Joseph Hatcher, who drives all the way down from Southern Oregon to suffer through this mission. 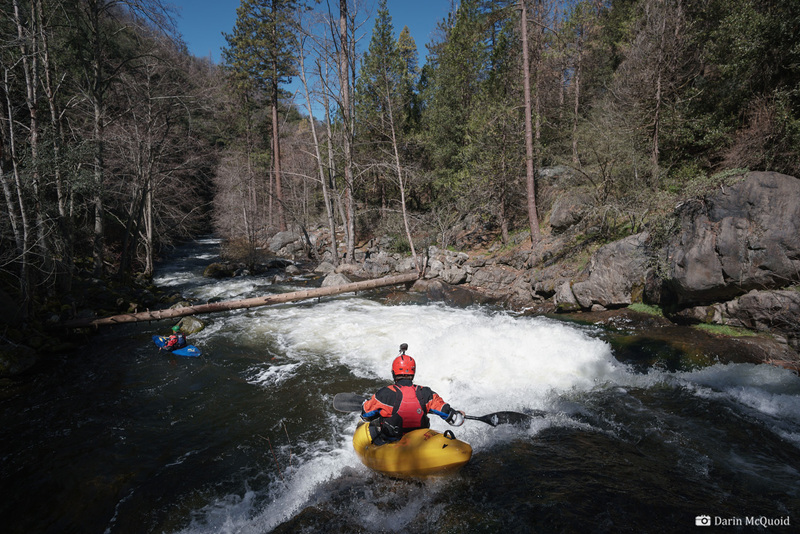 With an average gradient of five-hundred feet per mile, the river between the Ladybug trailhead and Whiskey Log is destined to be full of portages, some in gorges sure to require tricky rope work. Unlike the Marble Fork, none of it even looks good from the trail, so it's fitting that we shoulder the burdon on April 1st. 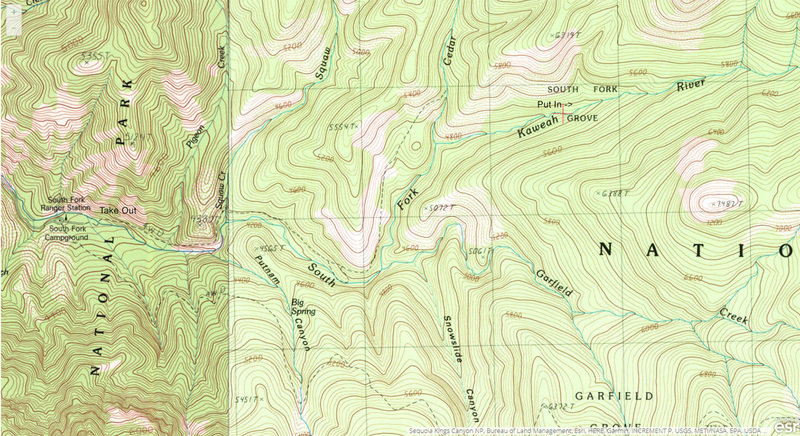 With an average gradient of 500 feet per mile, it must be all portages? Robbie Gilson, Joseph Hatcher and Darin McQuoid. Packed for two days we start before the heat and enjoy the trail. 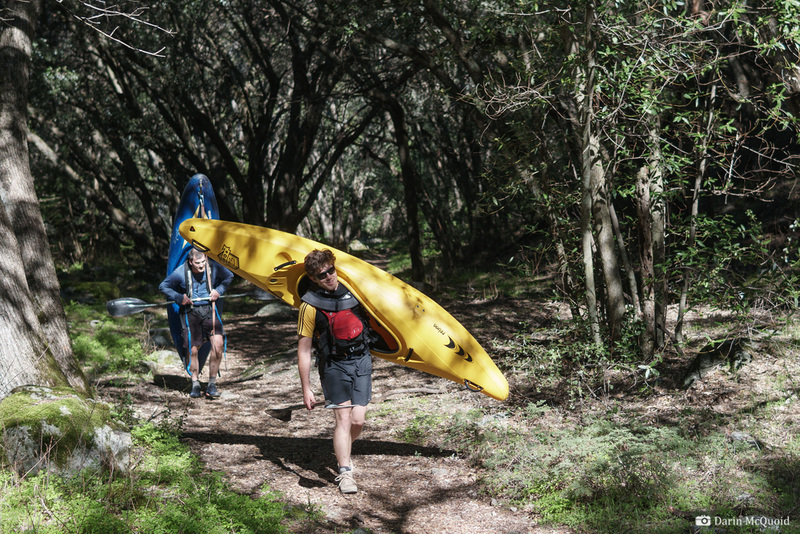 As much as one can enjoy hiking with a kayak. 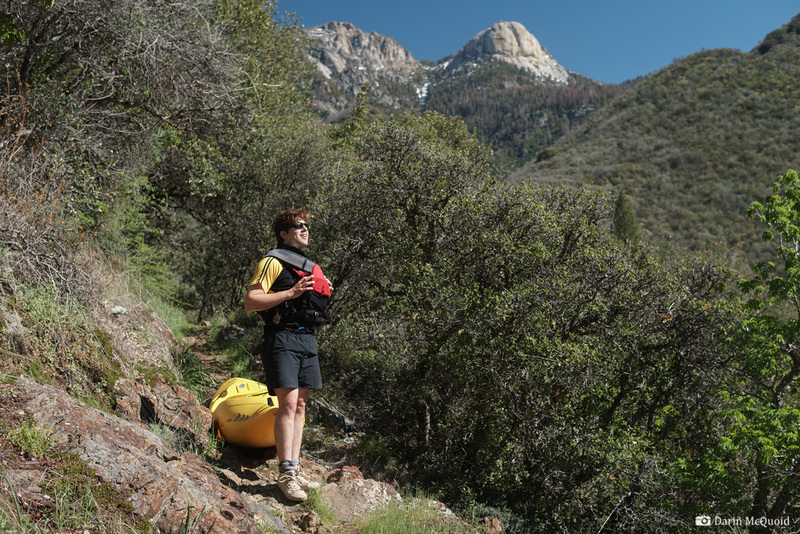 Robbie taking a moment to soak in some of the classic Sierra Nevada views. A quick peek into one of the gorges reveals that it's hard to see what's going on from up here. At Ladybug Camp we take a snack break and drop our overnight gear at a campsite. 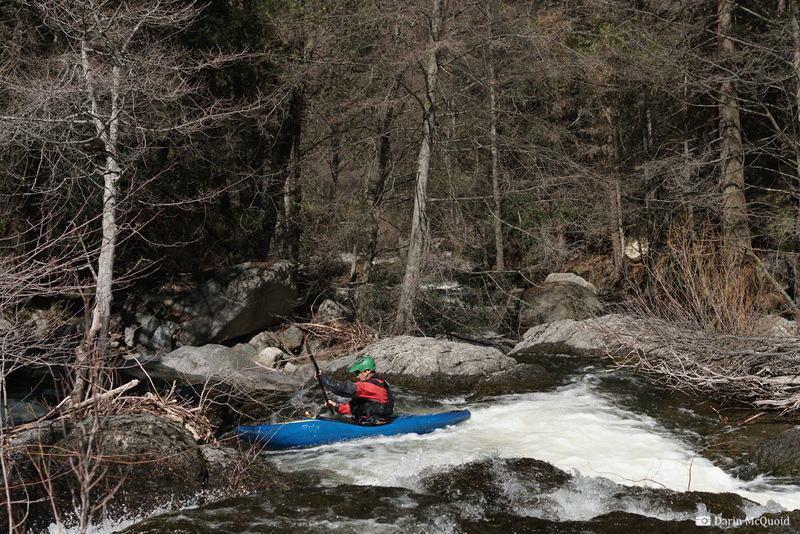 This commits us to paddling back down here today, but relieves us of the weight for the final three miles. It's been said this is the lowest elevation naturally occuring Giant Sequioa, which was brought down by a snowslide long ago. Homer's Nose in the background. 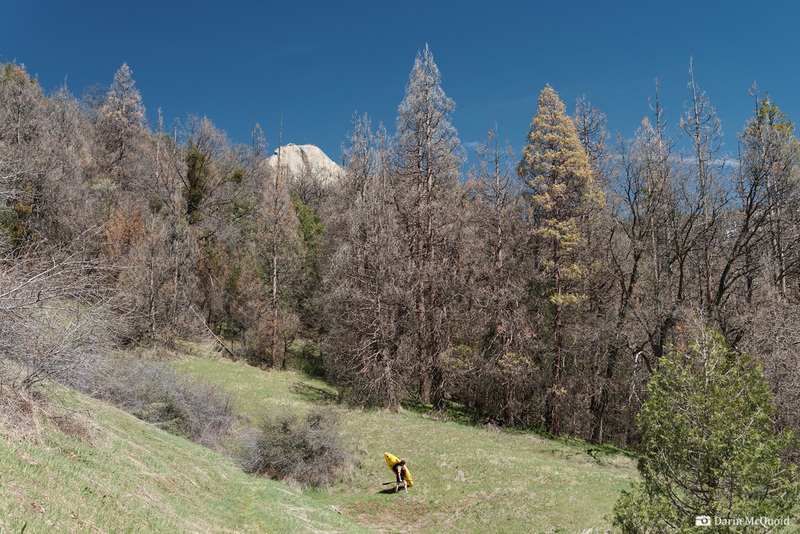 The devestation of the bark beetle and climate change is dramatic. Still lots of snow to tease us as Joseph Hatcher sweats it out. Around 12:30pm Robbie pulls into Cedar Grove. Now the trail gets rougher and steeper. 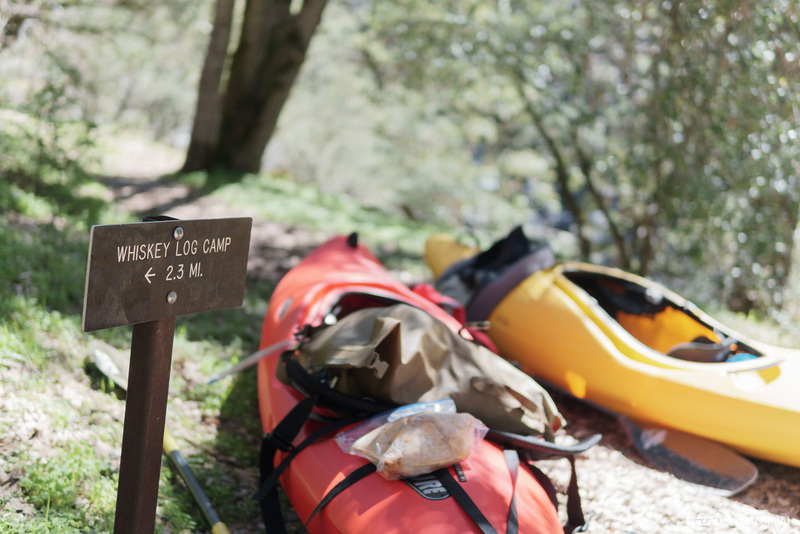 We make it to Whiskey Log camp and push on. I'm left to vague memories and intuition as to where exactly the big slide is. The trail has faded more every year, and soon we're going cross country. Thankfully instincts pay off, and two hours since Cedar Grove we're in the bushes at the top of the slide. 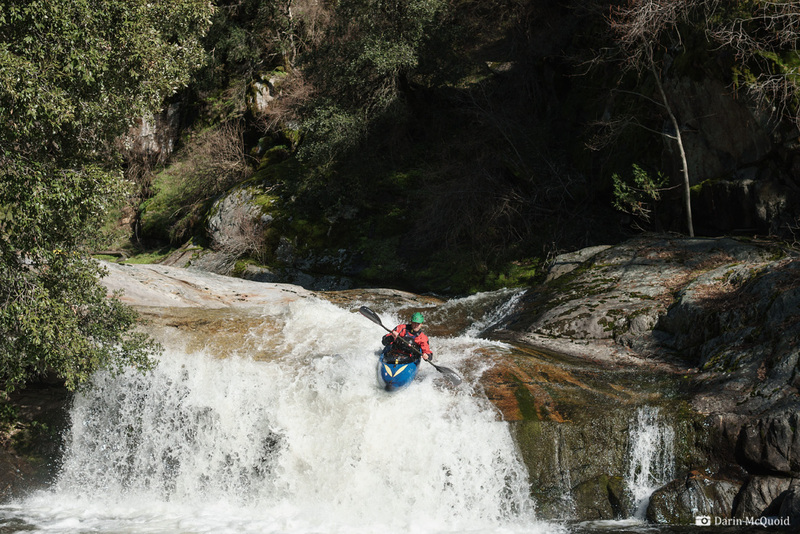 A moment is taken to pull off a few ticks before gearing up, as well as a a quick peek to admire the upstream waterfall. Fast, shallow and bouncy is the name of the game for the slide. 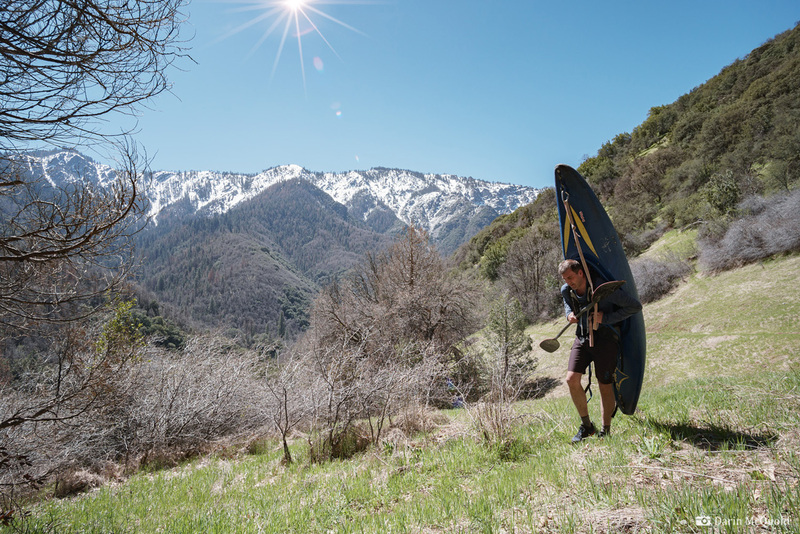 We all get some free chiropractic adjustments thanks to the South Kaweah, yet still emerge grinning - Joseph Hatcher. 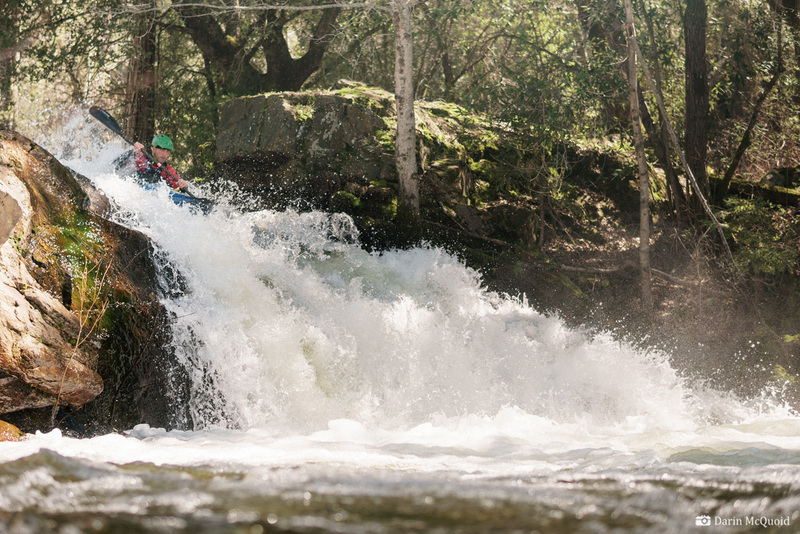 I expect nothing but mank downstream and get a pleasant surprise of some nice slides and complex yet clean ledges. Robbie Gilson. 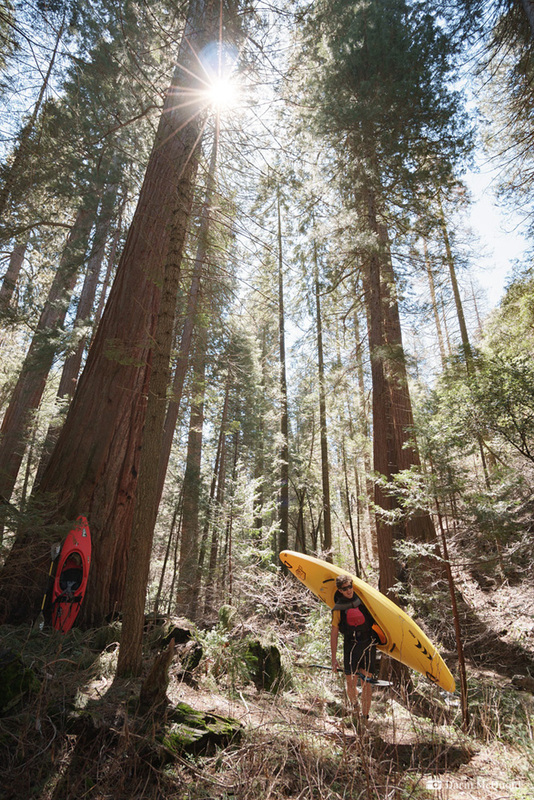 We're able to paddle to just above Whiskey Log camp, and hop out there. 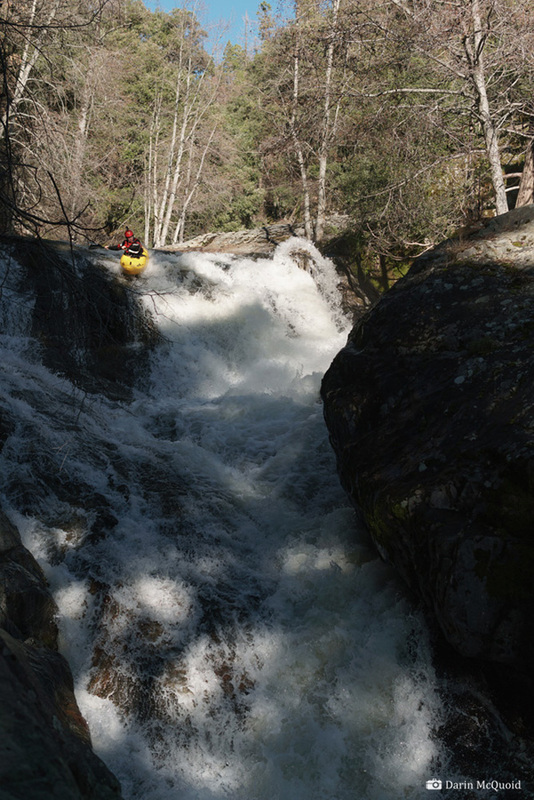 I'd scouted this before and the only expediant way to move downstream is on the trail, as there is a short gorge with some big, shallow slides and falls. 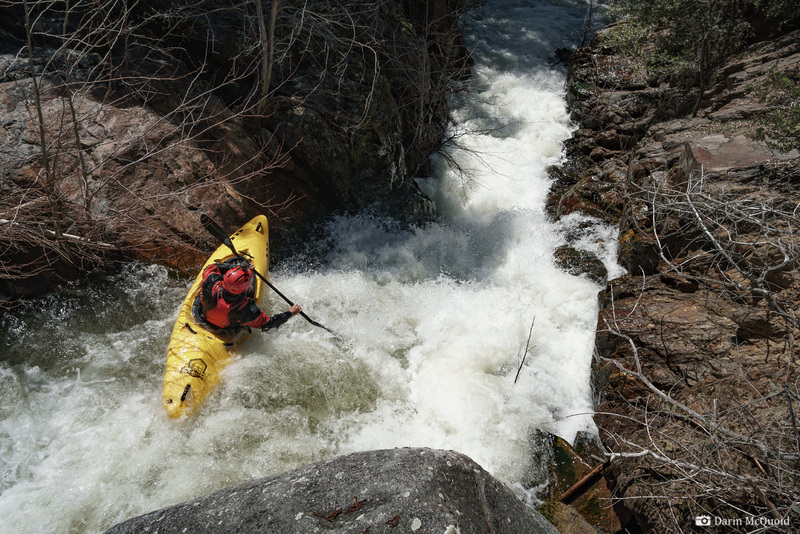 Always motivated, Robbie Gilson scrables down to pick off a slide in the middle of the portage. We follow a steep ravine to the river, and put in for a slide I'd seen while scouting access options. Joseph Hatcher. Now we're in the thick of it. The trail pulls away from the river for nearly a mile as it crosses Cedar Creek. Trees obscure satellite scouts, so we're headed into the unknown. Our campsite at Ladybug should be just on the other side of this gorge. Afternoon light as we push downstream into the gorge, starting off with a less than clean slide. Robbie Gilson. Every horizon line prompts paranoia of a time consuming portage. If one is even possible at all. Yet the horizons are good; we run two twentyish foot falls back to back. Joseph Hatcher. Below our second waterfall my gut instinct says this is not going to be good. The gorge walls pinch together, perhaps fifteen feed wide, with a horizon line of boulders. 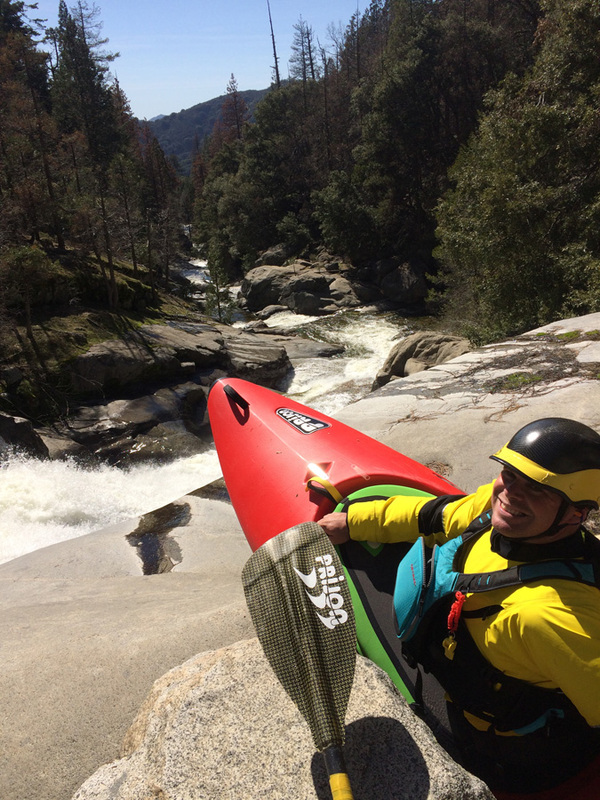 I hop out in an eddy and am startled to see an easy chute that drops about ten to fifteen feet, somehow there are no boulders blocking it, so with verbal beta the crew paddles on through. Some steep boulder gardens are kind enough to let us read and run, making great time into our campsite. 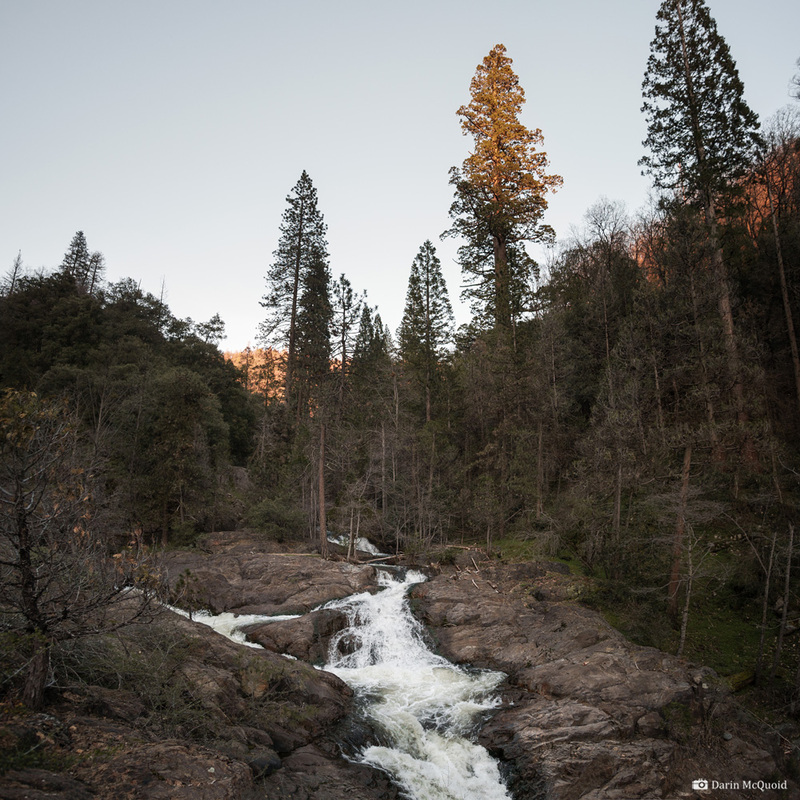 The last rays of sunlight hit the low elevation Sequia as we pull into our camp at Ladybug. 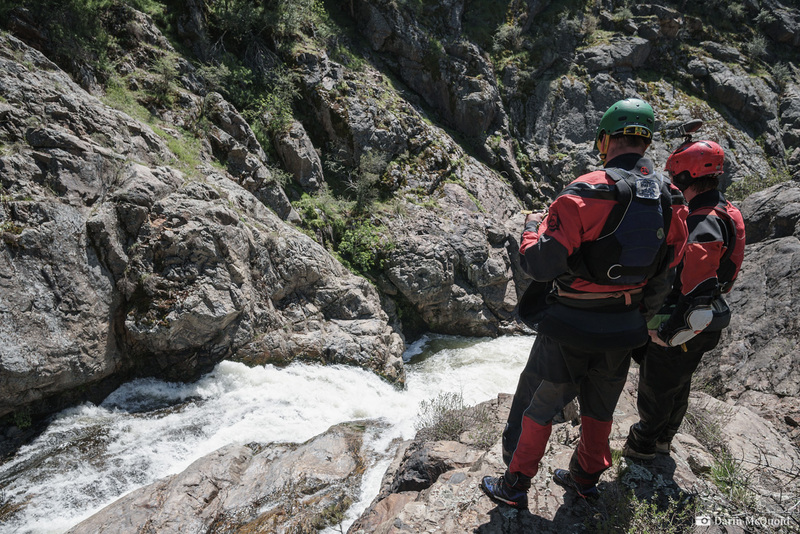 Garfield creek enters through Slowslide Canyon into the South Kaweah as Robbie Gilson and Joseph Hatcher reminisce about the day. It's a cold night with heavy dew, thus we spend a relaxing morning drying gear in the sunlight. We also know there isn't too far to go from here, so we're not in a rush. It's a walk out of Ladybug camp. We're back on the river in just a few minutes and the character is quite good as we run some slides and duck under a log. How can 500 feet a mile be read and run? We don't know but we're not complaining. Steep boulder gardens, low volume and small yet plentiful eddies make it possible. Joseph Hatcher. We walk Ladybug Falls as it lands on a rock and has a log. Robbie Gilson. 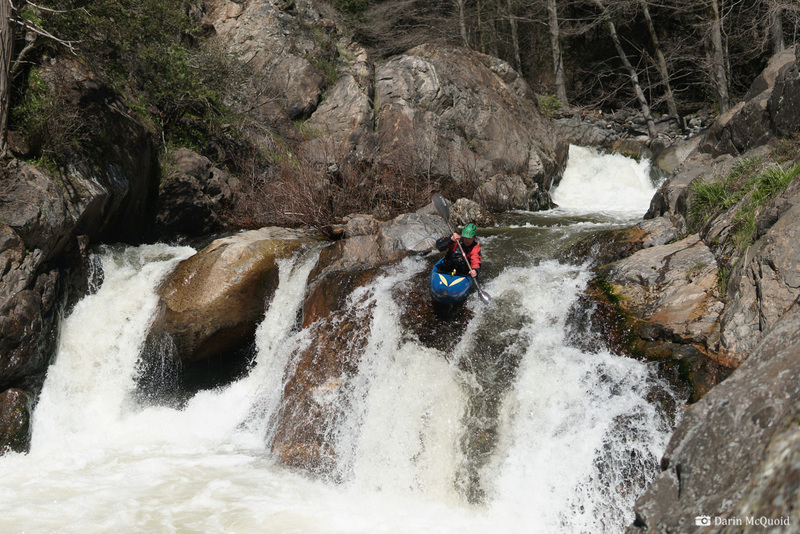 An occasional scout is necessary, yet we're able to pass beta on and make good time downstream, Robbie Gilson boofs into a boulder garden. How a river can be so steep, brushy, and good at the same time we don't understand and won't complain about. 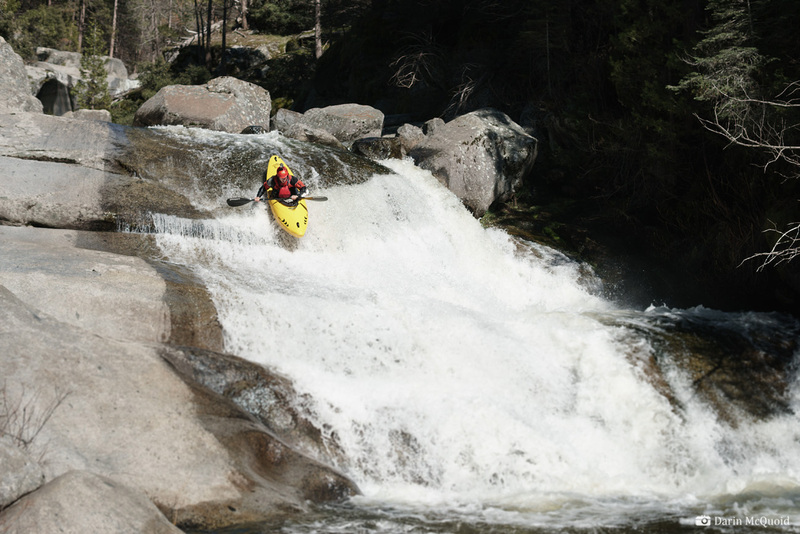 We're not shocked as it gets steeper, yet somehow this too can be paddled. Robbie Gilson in the lead in. 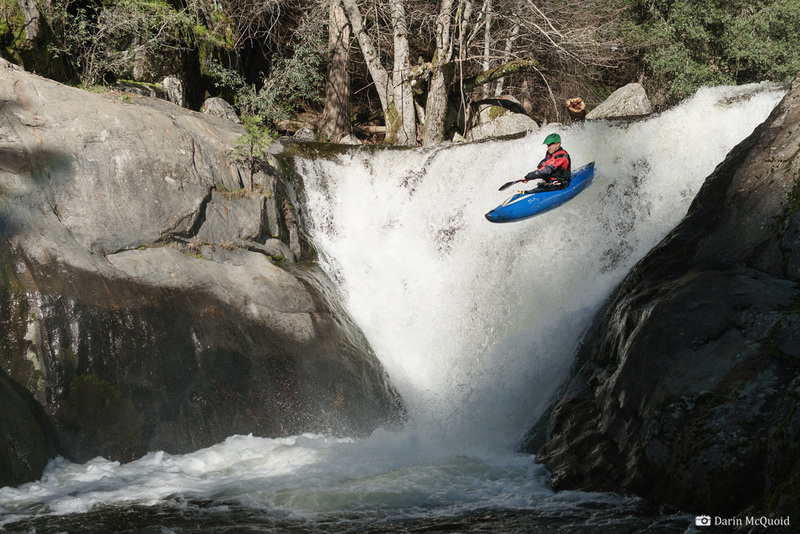 Robbie makes the crux move in one of the largest sequences of the creek, a three stage affair dropping about forty to fifty feet pool to pool. Somewhere in here we make an easy portage over boulders then it's on again as bedrock appears and the gradient gets steeper; Joseph Hatcher. Joseph Hatcher in the eddy as Robbie Gilson scouts. We all decide to scout and I'm able to confirm that the slide goes into what in summer months is a nice swimming hole. Swimming hole slide with Homer's Nose in the background, it treats us well with no swims, which is good at these flows. 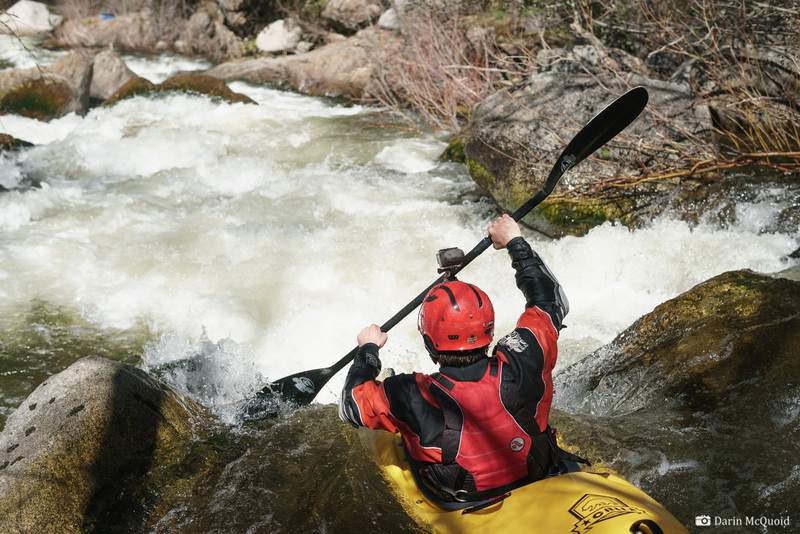 We opt to run it as a group so no one swims alone, it's impossible to set safety at river level for the landing pool. 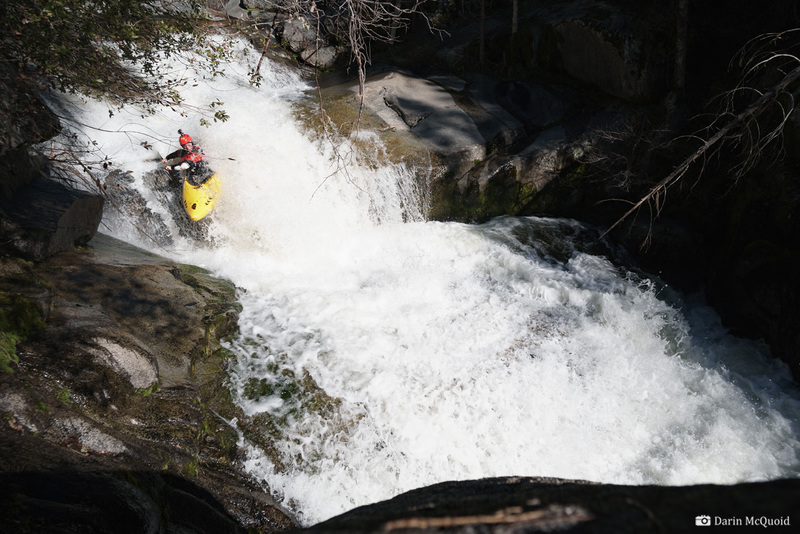 A short ways downstream, Joseph Hatcher runs one of the final ledges. One last slide, picked off by Robbie Gilson, the only one to run it. We all take out and hike ten minutes back to our cars as the river turns into a mank pile for the last quarter mile. 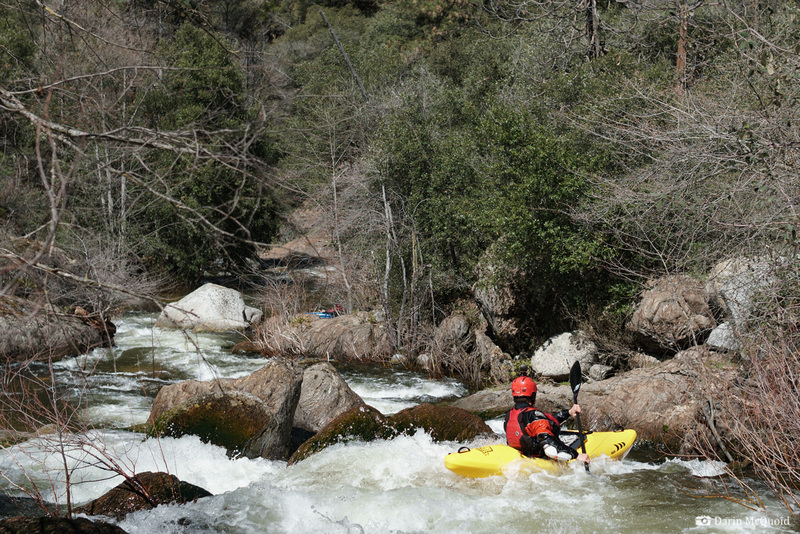 What to say about the Upper South Kaweah? It was a true Unicorn, we were lucky to be able to paddle as much of it as we did. It's a tough section to get the correct flows on.